Choose Lighting by Hammerworks classic handcrafted Hanging Copper Onion Lights HOL10. Especially relevant we also make these quintessential Cape Cod Onion Lights in antique brass & verdigris finish. In addition they coordinate perfectly with New England Style Onion Wall Lights OL10. If you also need a post mount fixture consider Onion Post Lights POL12 or POL10. Furthermore we craft our Hanging Onion Lights in 3 additional sizes as well as Colonial Ceiling Onion Lights. As you can see, no matter what size or style Colonial Onion Lights you need, Hammerworks delivers. While you can easily install Onion Lights throughout your home, we offer a variety of Colonial Wall Lanterns that provide a nice contrast. Colonial Reproduction Home Lights Barn Lantern W102 is a perfect example. Or perhaps you prefer the classic style of Traditional Copper Wall Lantern Small Post WM112 to complement your Hanging Onion Light. Another great combination is Cape Cod Colonial Wall Lights W106 with Colonial Onion Post Lanterns PRG12. With so many choices the possibilities are limited only to your imagination. 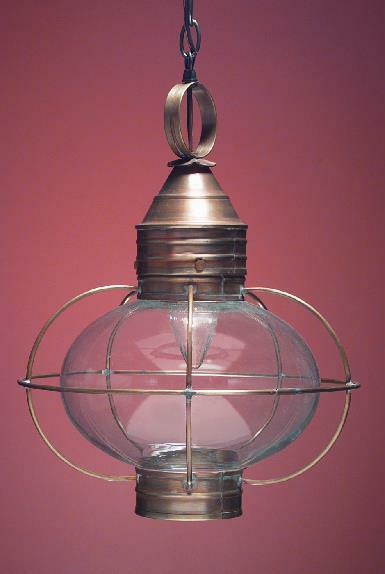 Although Colonial Hanging Lights are primarily intended for the exterior use, they present a multitude of interior lighting possibilities.. First of all, many customers place a Colonial Hanging Copper Lantern in the front entry or hallway. Not only that, the kitchen is an ideal location for Colonial Pendant Lighting. You can easily group two or three of them together over a kitchen counter or island. In addition, with so many sizes and styles to choose from, you can integrate them throughout a kitchen, dining, great room area. Of course if you prefer to mix and match your lighting, you can choose one of our many Colonial Tin Chandeliers or ceiling light styles to coordinate with a Copper Hanging Onion Lantern. Consequently we offer a solution to any area in your home that requires overhead lighting.